Your average goldfish has been known to live up to 40 years or older – if they’re lucky. Unfortunately domestic tanks are not conducive to longevity in goldfish. And then of course there’s all manner of predators both domestic and feral. It was reported recently that a British woman, Tanya, had been madly plastering up lost pet posters in Swindon. Her lost pet is Dave, nicknamed Davo and he’s a five-year-old goldfish. Tanya is quite sure that her two dogs are not responsible for the disappearance of Dave – because the fish tank has a lid on it. Tanya believes that the three remaining fish are despondent and one might be severely depressed. Some cynical journalists have suggested this lot are probably the guilty party. One can’t help wonder – are the surviving trio suffering from indigestion rather than depression? After all, the mystery of Davo’s disappearance remains unsolved – and to date no body has been found. The first theatre piece that I wrote, involved a character named Alphonse. He was a most attractive goldfish with bulbous eyes. When The Australia Council for the Arts provided me with a rehearsed reading, a director and professional actors, I decided Alphonse should appear on stage too. It was high summer and the day of the reading was fiendishly hot. I went down to my local pet store and purchased a large male goldfish. Then I panicked as we drove across town to the playhouse. I imagined all kinds of ghastly scenarios – the plastic bag pumped with air bursting, a car crash detaining our arrival and Alphonse dying from stress or heat stroke. All went well and the air conditioning at the playhouse was superb. Alphonse was quickly decanted into a cool round glass bowl for the evening’s performance. He was frisky and seemed quite the extrovert. While we waited for the audience to be seated, John confided that the fishbowl was a survivor from his divorce. Apparently the marvellous thing about glass and crystal wedding presents, is that the divorcing couple have a cupboard of breakables on hand. These can then be smashed dramatically during the ongoing hostilities. Initially I thought there was trouble looming. The lead actress got half-cut on wine before and during her performance. At rehearsals, I’d worried that she might be too placid and self-possessed for the role, but she ripped into her lines – while tossing back more wine – and did brilliantly. Meantime Alphonse circled lazily in the fishbowl, eyeballing her approvingly and his performance was faultless. We had a party afterwards to celebrate and everyone fussed over Alphonse and murmured sweet nothings into his bowl. At the end of the evening, he was transferred into a waiting jar and transported to his new home by a couple of my friends. They’d installed an upmarket fishpond and already had several goldfish in residence. But for unknown reasons the goldfish had failed to breed. I heard nothing about Alphonse for weeks. Then I got a phone call from my friends – all very excited – reporting that they’d discovered scores of tiny new goldfish hiding in the pond. It turned out that Alphonse was an unrepentant libertine who’d wasted no time in making amorous overtures to the female goldfish and chasing them around. I couldn’t help but wonder if Alphonse’s star performance had increased his self-confidence and emboldened him to take on a fishpond full of female fish. 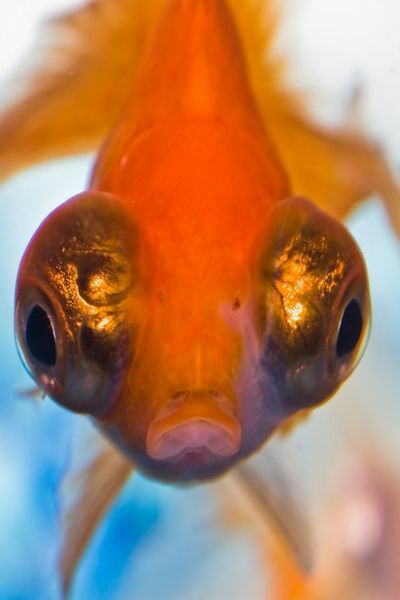 Photograph: by Benson Kua 2008 – featuring Lippy, his pet goldfish.